Tracks on the DR-70D are captured to SD card, SDHC or SDXC media – up to 128GB cards are supported. The recorder has tripod mounts on the top and bottom of the unit, allowing it to be mounted on a camera, a follow-focus cage, or used standalone. 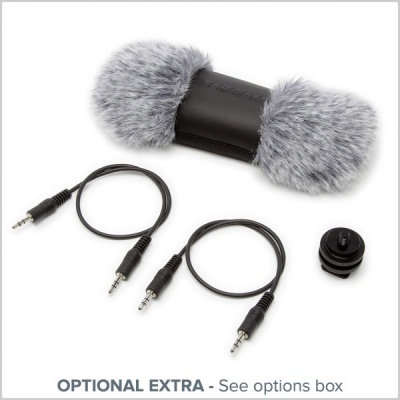 Other production friendly features include a slate tone, low-noise buttons, a powerful headphone output, and standard AA battery power. 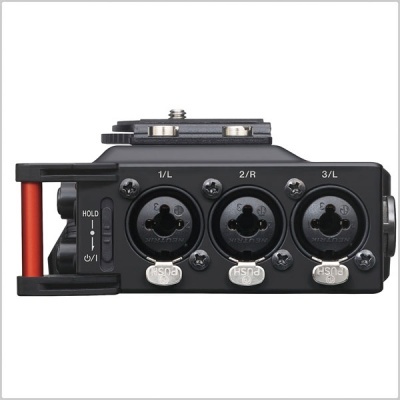 (4) XLR/TRS inputs are built-into the DR-70D. The four-channel design enables combinations of shotgun microphones, lavaliere mics, and the built-in stereo mic to be recorded individually. Channels 1 and 2 can be set to stereo input and channels 3 and 4 can be set to the built-in mics, making a variety of mic configurations possible. Dual Recording mode can be used to create a backup file that is simultaneously recorded at a different level to prevent clipping when levels exceed the maximum input. 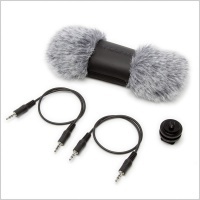 The second track is recorded up to 12dB lower as a safety track to prevent distortion – if your input signal overloads, you have a backup that isn't distorted. Each of the four inputs is sent to a stereo mixer. This allows each input to be recorded individually for post production while a stereo mix is sent to headphones and the camera guide track. 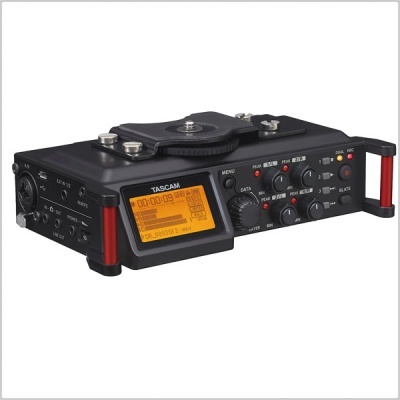 Microphone preamps do a lot of work to convert your mic-level signals to recordable levels, so they have a big impact on the quality of the audio that is recorded. The DR-70D uses TASCAM HDDA microphone preamps - created through careful selection of parts. An NE5532 op-amp was selected for its outstanding effect on audio quality. 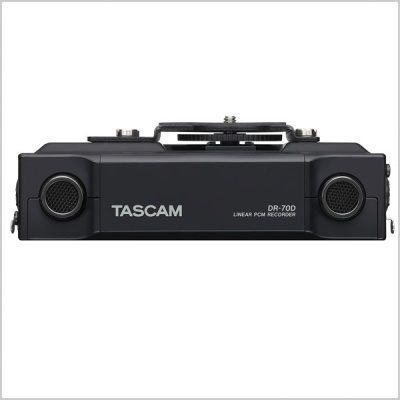 Through a mix of discrete architecture and hand-picked components, TASCAM has achieved an equivalent input noise level of −120 dBu. 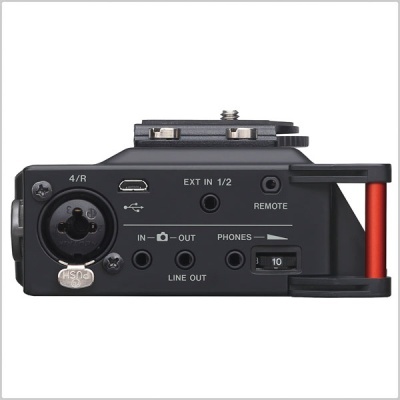 * Shoe mount adapter included in AK-DR70C (sold separately) is needed when mounting DR-70D on top of the camera. A stereo mix of your audio is sent to the camera output for later synchronization in your editing software. Simply drop your audio and video into the multi-camera feature of most editing software and audio will be automatically synced. Alternatively, software such as Red Giant Plural Eyes can be used to automatically sync audio and video. Manual insertion : Press and hold the SLATE button to produce a slate tone. The Camera In jack allows playback from your camera to evaluate a take. 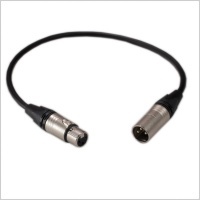 Either the camera signal or DR-70D can be monitored through the headphones. 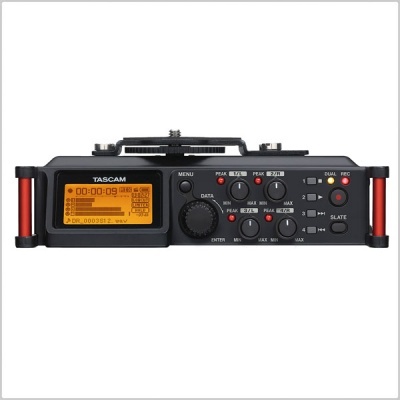 Set to "MIC / MIC+PHANTOM"
DR-70D + BP-6AA *BP-6AA is using the alkaline batteries (EVOLTA). The table below shows the maximum recording time on SD/SDHC cards of different capacities for different file formats for recording. The recording times shown above are estimates. They might differ depending on the SD/SDHC card in use. The recording times shown above are not continuous recording times, but rather they are the total possible recording times for the SD/SDHC card. 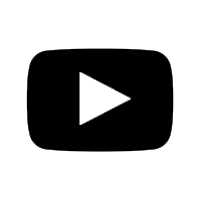 If recorded in mono in WAV files, the maximum recording time will be double the figures above. For dual and 4-channel recording in WAV/BWF format, the recording times are about half those shown above.